It had to end sometime, but Oregon was hoping to postpone the inevitable for at least one more season. 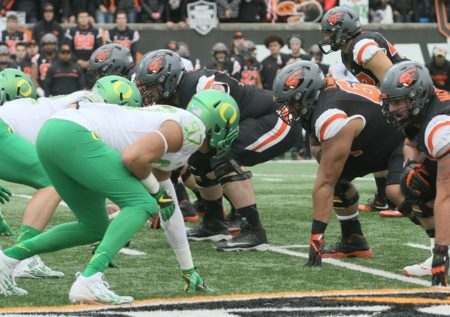 The Ducks’ eight-game win streak over their in-state rival Oregon State ended with a thud Saturday Night with a 34-24 Beaver victory in front of a sold out Reser Stadium. Both teams ended the season with a 4-8 mark, but Oregon State’s 4-8 mark feels a lot better for them than Oregon’s 4-8 record. One team is on its way up while the other team is filled with so many question marks that it would make The Riddler happy. For a while, it looked like the Ducks would escape Corvallis with the win as Oregon held a 24-14 lead in the middle of the third quarter. From there it was all Beavers and the Ryan Nall Show. The sophomore tailback rushed for 155 yards and four touchdowns as the Beavers run over, around and through an Oregon defense that was clearly beat up from a long season. Oregon State took advantage of the reeling Duck defensive unit by running in their final 22 plays of the game. Oregon State could have announced that it was rushing the ball and it wouldn’t have made any difference. Nall’s fourth score came with just under two minutes left and it was the nail in the coffin. Oregon State was up 27-24 when it went on a nine-play (all rushes), 68-yard drive that took 5:17 off the clock. The Ducks needed to hold the Beavers in any way possible and they couldn’t do it. A touchdown would mean the end of the game and Oregon still couldn’t stop it. The Beavers rushed for much of the game, not just on that last drive. Oregon State rushed the ball 53 times for 310 yards. Quarterback Marcus McMaryion only passed for 101 yards, but he didn’t need to throw the ball all that often. The Ducks’ offense was good for the first 40 minutes of the game. Quarterback Justin Herbert was 16-of-28 for 180 yards and a touchdown. But after Oregon went on a four-play, 60-yard drive for a touchdown with its first possession of the second half, the Duck offense was mostly stagnant. Aiden Schneider did boot a 46-yard field goal with 10:38 left in the third quarter to give Oregon the 24-14 lead. Oregon had just three more possessions for the rest of the game. That’s how much the Beavers were able to control the ball and more importantly, the clock. Oregon State’s had the ball for 39:55 of the 60-minute game. The first half was an even contest as it was a 14-14 game headed into halftime. Nall put the Beavers on the board first on a 12-yard run, but the Ducks tied the game quickly on their ensuing possession. Tony Brooks-James ended a 10-play, 75-yard drive with a three-yard run. After stopping the Beavers, Oregon was able to take the lead thanks to some razzle dazzle. The Ducks ran a reverse where the ball eventually wound up in the arms of Jalen Brown. He then proceeded to throw a perfect pass to Darren Carrington for a 33-yard touchdown and the 14-7 lead. But the Beavers tied the game on a rare pass from McMaryion, a six-yard strike to fullback Ricky Ortiz. After the two teams returned from halftime, it didn’t take the Ducks long to strike. Herbert led a four-play, 60-yard drive in just over a minute. He threw a laser beam over the middle to Charles Nelson on a 23-yard touchdown. Unfortunately, that would be one of the last Duck highlights of the afternoon. Now the Ducks will head into a rare off0season where they don’t go to a bowl game and the future is a huge unknown. They might enter the 2017 season with a brand new coaching staff and a new look depending who they replace Mark Helfrich with, if they even replace Helfrich at all. If Oregon does retain the coach, he’ll have a long off-season of recruiting and convincing donors and fans that the light at the end of the tunnel is indeed just a light and not an oncoming train of doom. Right now, no one is sure of anything concerning the Oregon football program. The post Beavers End Civil War Skid 34-24 appeared first on DuckNews.com.